Whilst the administrators and moderators of this forum will attempt to remove or edit any generally objectionable material as quickly as possible, it is impossible to review every message. Therefore you acknowledge that all posts made to this forum express the views and opinions of the author and not the administrators, moderators or webmaster (except for posts by these people) and hence will not be held liable. You agree not to post any abusive, obscene, vulgar, libellous, slanderous, hateful, threatening, sexually-oriented or any other material that may violate any applicable laws. Doing so may lead to you being immediately and permanently banned (and your service provider informed). The IP address of all posts is recorded to aid in enforcing these conditions. You agree that the webmaster, administrator and moderators of this forum have the right to remove, edit, move or close any topic at any time should they see fit. As a user you agree to any information you have entered above being stored in a database. While this information will not be disclosed to any third party without your consent the webmaster, administrator and moderators cannot be held responsible for any hacking attempt that may lead to the data being compromised. 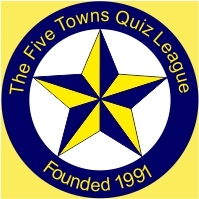 By posting on the Five Towns Quiz League discussion forum you agree to be bound by these conditions. BE INFORMED HERE AND NOW, THAT IT IS A CONDITION OF REGISTRATION THAT IF YOU REGISTER ON THE FTQL FORUM UNDER A NAME WHICH MAKES IT ANYTHING OTHER THAN PERFECTLY CLEAR WHO YOU ARE, YOUR REGISTRATION WILL BE DELETED AND YOUR IP ADDRESS BLOCKED FROM MEMBERSHIP. FURTHERMORE, IF YOU FAIL TO SUPPLY A WORKING EMAIL ADDRESS, YOUR REGISTRATION WILL BE DELETED AND YOUR IP ADDRESS BLOCKED FROM MEMBERSHIP. NICKNAMES ARE ALLOWED IF YOU SHOW A WORKING EMAIL ADDRESS, ASSUMED NAMES ARE NOT.